Today I have two cards for you. Both the same card but one is coloured with all Prisma and the other with Copic & Prisma for a bit of shading. I am using Travelling Colors from Saturated Canary. You can find the stamp HERE! The 1st one is Copic with Prisma shading. The 2nd one is all Prisma pencils. I tried to keep the colours very similar. I couldn't decide which version I liked better but I am leaning toward the vibrancy of the Copic. What do you think? Looking forward to your thoughts, have a wonderful day & thanks for stoppin' by! This quirky adorable little lady is from Saturated Canary & she is called Party Hardy. You can find her HERE in the OCS store. I thought it would be fun to play in the Splitcoaststampers Weekly Sketch Challenge. Don't forget that the OCS Blog has an "Anything Goes Challenge" this month. 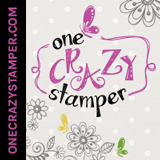 Come play for your chance to win a set of three stamps from Little Darlings. You can find the challenge HERE. I'm back today with another Saturated Canary, this one is Nevaeh (or heaven spelled backwards, thanks Debbie)! I think this girl is just so precious and innocent..don't you!! This little lovely is coloured with Copic's on Xpress It paper. Oh and this time I did use some Prisma's for shading. Have a wonderful day & thanks for visiting!! Well for most of us it is back to the regular grind of daily work...already! The holiday's seem to take forever to come but they are gone in a flash. I took a little breather over the holiday's to spend some quality time with my daughter. For the first time in YEARS I went sledding..yep I said sledding. For those of you who know me you know I am really a sunshine girl at heart, if the temp drops below 70 degrees I stay inside till it returns to optimal temps. My neighbours always see my hubby and kids outside and they laugh because they never see me, unless I'm running to my van...which better be all warm with that automatic starter thingy!! But I went shopping this year and actually purchased real winter attire suitable for events like sledding...oh I even own winter boots now....you laugh but really I haven't had a pair of those in years....just didn't see the need to have something I didn't like. All kidding aside my daughter and I were toasting warm as we enjoyed our sledding adventure...my hubby is the one taking the pic's for us. There needed to be some sort of proof for this momentous occasion!! Thanks for stopping by today & hopefully I brought a little fun to your day! Happy New Year everyone!!! I hope you all enjoyed a wonderful end to 2012 and a glorious start to 2013. I hope 2013 will bring you much health & happiness!! I am not the New Year resolution type of gal, cause I can never seem to keep those resolutions going strong throughout the year. In fact usually by the end of the first week I've blown at least 3 or more of them. So I told myself no resolutions for 2013 other than to do what makes me happy...and that is to be with my family more....and colour. I have enjoyed a lazy start to 2013...sleeping in till a wopping 7:30 AM, usually I'm up at 5:30 AM...and I have been watching my daughter's favourite kiddie shows on TV...truth be told I love those shows...but don't tell Emilee because she thinks she is torturing me by making me watch them...it will be our little secret! So how am I starting my 2013 posts....well with a beautiful image from Saturated Canary of course...this beauty is called Bella. January 2013 is the start of new beginnings...and we have some new gals on the OCS Design Team! Welcome to Shari G., Kerri and Aaemie...we are glad to have you. Please come take a peak and the amazing work the OCS DT has for you in the "Anything Goes" January Challenge. You can find the post HERE! I'm so happy to be back to blogging...yeah! I hope everyone enjoyed a wonderful holiday season!! My daughter celebrated her 11th birthday on Dec. 27th...WOW 11 years have passed since we were blessed with our beautiful little princess!! Emilee's favourite colour is lime green...yes lime green. She begged Daddy to paint her room lime green, she wants everything to be lime green. She LOVES lime green!! So check this out...I made this card for her birthday with lotsa' bling she loves bling...who would have thought. So I added a bunch of rhinestones to her card but I kept the balance of the card quite simple...since I know my daughter and it's all about the image. I knew the first thing she would examine was whether it looked like her. I was delighted when she opened the card and the first thing she said was "Momma it looks just like me"! Mission accomplished! I am currently totally addicted to Saturated Canary images. I think it is because everytime I look at one of them I can see my little girl, they are quirky, fun and full of vinegar....they totally speak to me. So of course I chose Ellie's Birthday from Saturated Canary for Emilee's card. Emilee is quite the little "sewer". She has been taking sewing lessons for a year now and just loves it. Bless her little heart she has been working on my 27+year old machine at home with no complaints..well except...the odd little comment like "Momma this thing is ancient isn't it". So we decided the perfect gift for her birthday would be a new machine that she could call her own. Her she is tickled to bits with her new machine...oh and proudly showing off her card. When I went to download the pictures of the card and Emilee I found these adorable pictures of our dogs Whisky & Lola. I thought it was a good time to share a couple more photo's with you. Emilee's other passion is taking pictures and video's. Every device we have is full with her creations and visions. I have to say that it is amazing to look at life through the eyes of a child. The quilt in the background...lime green of course is one of Emilee's creations...1st Prize at the Bolton Fall Fair this past Fall...yeah! Sorry for such a long post!! Hope you enjoyed it!! On the eve of Halloween I have this awesome image from Saturated Canary for you. This is Vampire Rose...can you tell? I coloured her with totally untraditional Halloweeen colours, by mistake actually. I wasn't paying attention when I started colouring her and totally missed her vampire teeth. Okay stop laughing already...I know I should have got it by the name...Vampire Rose...but nope I didn't. I loved her so much and thought she was just so cute that I pulled pretty colours for her. Anyway I laughed so hard at myself that I thought you should have a laugh at my expense too...so here she is in all her pretty colours!